Lawrence English’s art can be both devastating and intensely beautiful, often at once. This autumn morning I am listening to his 2009 album, A Colour for Autumn, which evokes for me all the sensations of Keat’s “To Autumn”—both the melancholy of the dying year and the intense vibrant life of a world in harvest. When that album closes I summon the thundering shimmer of his Cruel Optimism, one of my favorite albums of this year—Elsewhere, in another time, I lose myself fixated before his photography—stark landscapes, machines, mist, crows. Then there is his collaboration with Jamie Stewart as HEXA, a “sonic response to David Lynch’s Factory Photographs,” itself almost more Lynchian than Lynch’s own soundscapes. Many hours I have allowed these sounds and visions to wash over me, as I write, and dream. 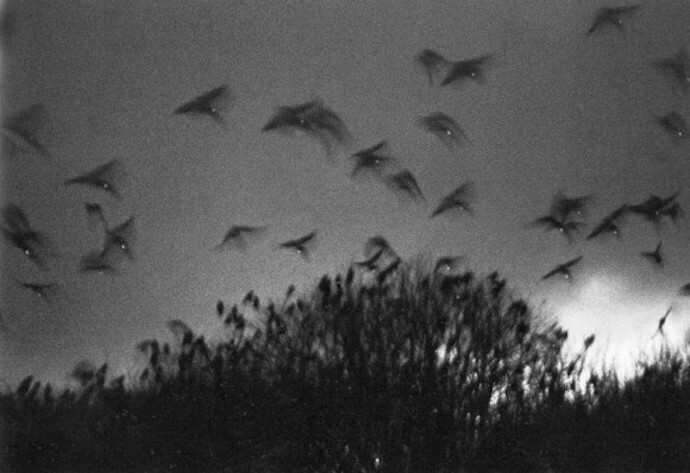 And now I have this to lose myself to, Lawrence English’s thoughts on Masahisa Fukase’s haunting, beautiful photography. RK: Can you explain why you chose Masahisa Fukase’s Karasu? What was first encounter with Karasu? 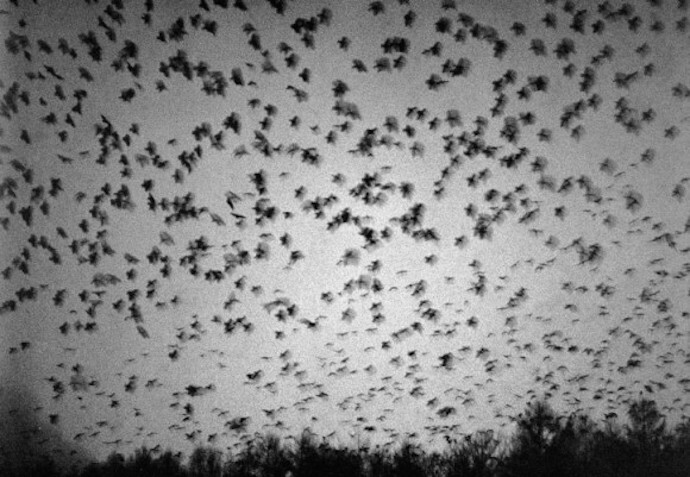 LE: Masahisa Fukase’s Karasu is a work of complete obsession. I first discovered the book about half a decade ago. I am a fan of Japanese post-war photography and particularly that generation of photographers born out of the late 1960s and associated with publications such as Provoke. In the past couple of years I’ve been think about this idea of obsession a great deal. It’s one of those human conditions that characterises us as a species. Fukase’s work was born out of deep grief about his marriage breaking down. In those moments, where he felt he lost everything, he turned towards a very particular approach of resolving himself to be able to continue in some fashion. I imagine the direction was not clear, shot to shot, but the process and focus lent a kind of possibility to continue. What resulted from this obsession born of grief and suffering is something so breathtakingly beautiful and painful all at once it’s difficult to understand how if affects you, page to page. When I was making Cruel Optimism, I actually spent many many hours with this book. It was in fact one of the secret hearts of that record. I even approached the estate about using one of the images as the cover for it. Alas it wasn’t possible. Would you describe Karasu—try to capture what makes it significant and interesting. Please be as technical (or not) as you like—I’d like to come as close as possible to seeing these photographs from your perspective. What I find most fascinating about Karasu is the layout of the images. There’s one particular sequence I find truly provocative; specifically three images of a cat, a women and a fish. Somehow he builds an incredible through line across these disparate subjects. It’s a piece of magic I find myself being struck by every time I look through the book. I think as well the lack of clarity that he maintains in some images I find very powerful, they are like captured hallucinations. I sense I am experiencing the world through his eye, augmented by the lens, but very much his sensing of the world. It’s a kind of static embodiment almost. I am always attracted to where when I feel there’s an occupation of the self by another being. What qualities do you see in Fukase’s work that also exists in your own? I must confess to a deep desire to explore the potentials of embodiment as a means for recognising the capacity of art to impact upon us. For me, it’s about a recognition of ideas such as the body as an ear. That there’s a synesthetic nexus that exists at the threshold of vibration whereby sound transgresses from the auditory into the tactile. I explore the threshold a great deal in my performance practice. I think I also share Fukase’s passion for texture and the potential of perspective on transforming the comprehension of a subject – be it visual or audio. More specifically can you point to one of your own works to illustrate qualities you find compelling in Karasu? The concert performances of Cruel Optimism are perhaps the best exploration of this idea I have had the pleasure to pursue. Finally, do you approach photography in the same way you listen to music? How so? If anyone has been following me on Instagram they will have noticed a particular study of certain things. I think for me, visual works occupy a different time relation to sound work. That’s part of their charm, but in my opinion one of their shortcomings also. I like to think there’s some correlation between the approaches, but arguably I think celebrating their differences is one of the joys of exploring across mediums.